Said to have been that of Sallust. pea loo ; b.c. 2o to a.d. 20. Tables were made of marble, gold, silver, and bronze, and were engraved, damascened, plated, and enriched with precious stones. The chief woods used were cedar, pine, elm, olive, ash, ilex, beech, and maple. 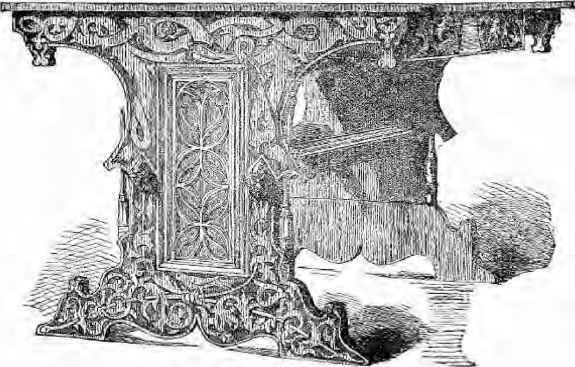 Ivory was much used, and not only were the arms and legs of couches and chairs carved to represent the limbs of animals, as has been noted in the Assyrian, Egyptian, and Greek designs, but other parts of furniture were ornamented by carvings in bas relief of subjects taken from Greek mythology and legend. Veneers were cut and applied, not as some have supposed for the purpose of economy, but because by this means the most beautifully marked or figured specimens of the woods could be chosen, and a much richer and more decorative effect produced than would be possible when only solid timber was used. As a prominent instance of the extent to which the Romans carried the costliness of some special pieces of furniture, we have it recorded on good authority (Mr. Pollen) that the table made for Cicero cost a million sesterces, a sum equal to about £9,000, and that one belonging to King Juba was sold by auction for the equivalent of £10,000. occupation of the wife and family; for although the position of the Roman wife was superior to that of her Greek contemporary, which was little better than that of a slave, still it was very different to its later development. 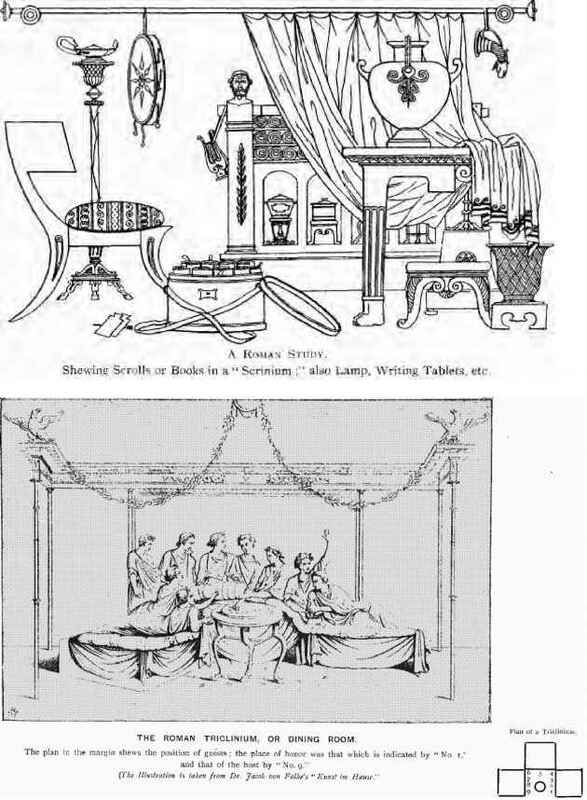 The illustration given here of a repast in the house of Sallust, represents the host and his eight male guests reclining on the seats of the period, each of which held three persons, and was called a triclinium, making up the favorite number of a Roman dinner party, and possibly giving us the proverbial saying—"Not less than the Graces nor more than the Muses"—which is still held to be a popular regulation for a dinner party. But federally occupied by one. on aocn. 'iDne nf Rfrat.-^ gCMrftfrfM flit fiRKGM fealiiHls.6(5. From discoveries at Herculaneum and Pompeii a great deal of information has been gained of the domestic life of the wealthier Roman citizens, and there is a useful illustration at the end of this chapter of the furniture of a library or study in which the designs are very similar to the Greek ones we have noticed; it is not improbable they were made and executed by Greek workmen. Mr. Hungerford Pollen mentions that wearing apparel was kept in vestiaria, or wardrobe rooms, and he quotes Plutarch's anecdote of the purple cloaks of Lucullus, which were so numerous that they must have been stored in capacious hanging closets rather than in chests. In the atrium, or public reception room, was probably the best furniture in the house. According to Moule's "Essay on Roman Villas," "it was here that numbers assembled daily to pay their respects to their patron, to consult the legislator, to attract the notice of the statesman, or to derive importance in the eyes of the public from an apparent intimacy with a man in power." 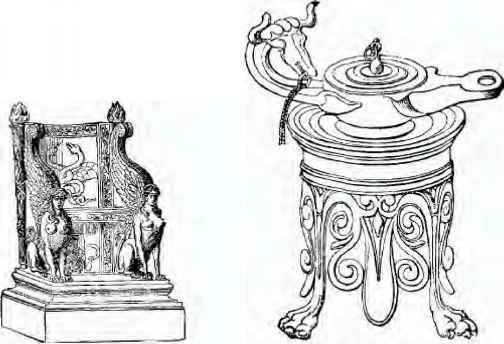 The growth of the Roman Empire eastward, the colonisation of Oriental countries, and subsequently the establishment of an Eastern Empire, produced gradually an alteration in Greek design, and though, if we were discussing the merits of design and the canons of taste, this might be considered a decline, still its influence on furniture was doubtless to produce more ease and luxury, more warmth and comfort, than would be possible if the outline of every article of useful furniture were decided by a rigid adherence to classical principles. We have seen that this was more consonant with the public life of an Athenian; but the Romans, in the later period of the Empire, with their wealth, their extravagance, their slaves, their immorality and gross sensuality, lived in a splendour and with a prodigality that well accorded with the gorgeous colouring of Eastern hangings and embroideries, of rich carpets and comfortable cushions, of the lavish use of gold and silver, and meritricious and redundant ornament. This slight sketch, brief and inadequate as it is, of a history of furniture from the earliest time of which we have any record, until from the extraordinary growth of the vast Roman Empire, the arts and manufactures of every country became as it were centralised and focussed in the palaces of the wealthy Romans, brings us down to the commencement of what has been deservedly called "the greatest event in history"—the decline and fall of this enormous empire. For fifteen generations, for some five hundred years, did this decay, this vast revolution, proceed to its conclusion. Barbarian hosts settled down in provinces they had overrun and conquered, the old Pagan world died as it were, and the new Christian era dawned. From the latter end of the second century until the last of the Western Caesars, in A.D. 476, it is, with the exception of a short interval when the strong hand of the great Theodosius stayed the avalanche of Rome's invaders, one long story of the defeat and humiliation of the citizens of the greatest power the world has ever known. It is a vast drama that the genius and patience of a Gibbon has alone been able to deal with, defying almost by its gigantic catastrophes and ever raging turbulence the pen of history to chronicle and arrange. When the curtain rises on a new order of things, the age of Paganism has passed away, and the period of the Middle Ages will have commenced.